Opposition does not stall legislative agenda; Upper House passes two bills. Kavita Chowdhury and Archis Mohan report. It was a day when Bharatiya Janata Party chief Amit Shah launched a direct attack on Congress counterpart Sonia Gandhi on the AgustaWestland issue. The Congress attacked Shah for “irresponsible statements” but, for a change, chose not to obstruct legislation in Parliament. The Rajya Sabha, where the government is in a minority, deliberated and passed the Constitution (Scheduled Castes) Order (Amendment) Bill and The Industries (Development and Regulation) Amendment Bill, 2015. Fireworks between the ruling BJP and the Congress took a backseat on Thursday. Both benches deliberated the matter of a one per cent excise duty on gold jewellry and then went on to discuss the SC amendment. The Congress strategy appears to be a shift from the hard stance of Wednesday, when former defence minister A K Antony gave a spirited argument for the decisions taken by the then Congress-led government on the helicopter deal with AgustaWestland. Sonia Gandhi had said she was “not afraid” of any probe. BJP president Amit Shah said on Thursday that Sonia Gandhi should name those who received the “kickbacks”. “All I want to ask her is that those who gave a bribe are in jail in Italy; then, where are those who received the kickbacks? Who were in power at that time? They are responsible and they should bring out the truth. It should be disclosed before the people of the country,” he said. Congress’ Pramod Tewari who had moved a notice for discussion on the AgustaWestland deal on Wednesday and then on Thursday as well, chose to withdraw his notice. Sources within the party said, Parliamentary Affairs minister Venkaiah Naidu had reached out to Congress leaders and urged them to allow legislative business to be transacted in the house. It also suited the Congress to not appear to be too obstructionist; the Congress thinking was that as long as the ruling party did not raise the issue and provoke them, the Congress too would not take it up. Furthermore, the Congress would not oppose any “non- controversial” legislation, like the Scheduled Caste bill which pertained to a large section of the public. On Friday, the upper house would be devoted to discussing private members bill. A controversial issue like the GST bill however is not on the cards. The Westland issue is, however, likely to be taken up on Monday in the Lok Sabha by the BJP. Three of its members have moved notices for discussion. Defence Minister Manohar Parrikar will reply. A call-attention motion was also moved on the issue by BJP’s Bhupendra Yadav in the Rajya Sabha, yet to be decided by the chair. The major item for this session is to be the Bankruptcy and Insolvency Code. 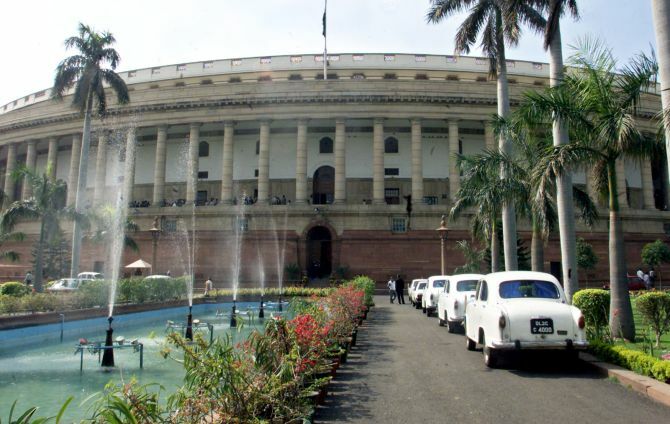 After the Lok Sabha wraps up its discussion on the Finance Bill, the Code will be taken up. On Thursday, a joint committee of Parliament presented its report on this. Finance Minister Arun Jaitley said on Wednesday that he expected passage in this session. As the issue of stressed loans and willful default is in the public eye, all political parties could cooperate. More so as the committee report has been adopted without any dissent notes, with all the amendments suggested by opposition members having been taken on board. Later, he also took a dig at Gandhi’s Italian origin, saying she should at least have faith in an Italian court’s decision. In the Lok Sabha, the BJP’s Meenakshi Lekhi alleged middleman Christian Michel had been given Rs 50 crore by the Italian company to manage the media and clinch the deal. Congress members protested and their leader, Mallikarjun Kharge, pointed out that their demands to put the record straight had been denied by the Speaker but Lekhi was allowed to speak. Lekhi, however, continued with her Zero Hour mention; amid the protests, Speaker Sumitra Mahajan adjourned the House for the lunch recess.